Household electricity use--and cost--can peak on hot summer days. Efficient choices for cooling your house can save a lot of money. Using less electricity also reduces air pollution, mercury emissions, and greenhouse gas emissions. A win-win for you and the environment! Use a fan when people are around, but don’t leave a fan running in an empty room. A fan feels cool because of the wind on your skin. It doesn’t actually make the room cooler, unless it’s placed in a window with the purpose of pulling in cool outside air. Open the windows when outside temps dip below or match inside temps. In the evening I put a fan in the window to pull in the cool night air. Turn off and avoid heat sources, like the oven, stove, incandescent light bulbs, and electronics. 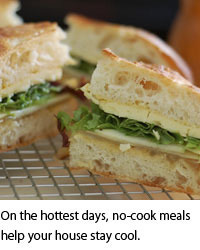 I found this fun page with 22 recipes for hot-weather eating, including the sandwiches pictured above. Avoid creating steam, because it raises the humidity level. Steam comes from boiling water, hot showers, washing dishes, or hanging wet clothes. On hot days I take short, cool showers and hang my clean clothes on a drying rack outside. Install and use a programmable thermostat. 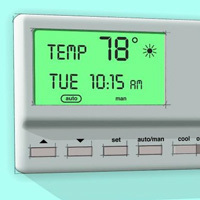 Set the temperature for 78 degrees when you are home and warmer when you are away. This will feel refreshing on a hot, humid day. Enroll in utility energy-saving programs, like Xcel Energy’s Savers Switch program, to get discounts on summer electric bills. Tune-up your air conditioner. Just like your car, your AC unit needs some TLC from time to time to ensure it is operating efficiently. Cottonwood fuzz, grass, leaves, and dust can accumulate on the coils of your air conditioner causing it to work harder and wear out sooner. You can do it yourself! To learn more about how to keep your AC unit running well, visit the Home Energy Resource MN website. Get an Advanced Energy Audit. Find out how your house is working. An advanced energy audit will provide an evaluation of your home’s energy use, insulation levels, air leakage and mechanical systems. Utility companies and private contractors can provide audits; check with your utility or the Minnesota Building Performance Association. If you are ready to do more to save energy, check out more energy saving tips form the Minnesota Department of Commerce. The Do It Green! Directory--available online or in print--is an all-in-one resource for local, sustainable, and green merchants, grocers, retailers, contractors, designers, consultants and other businesses in Minnesota. It is searchable by location and business type. Interested in being a part of the only green business directory in Minnesota? Apply by September 1. Learn from experts how simple fixes around the house can make a big impact on your water usage at Water Use: Cutting-edge Conservation, July 16, 6-8 p.m., Century College (White Bear Lake). Get some help with that broken "something" that's been sitting in your closet at the Hennepin County Fix-It Clinics. July 20, noon-4 p.m., North Commons Community Rec Center (Minneapolis) and August 10, noon-4 p.m., Eden Prairie Senior Center. The 8th Annual Garlic Fest features fantastic foods, celebrity chefs, marvelous music, area artisans, goofy games…and lots of garlic--all in support of a healthy environment, sustainable farms and vital rural communities in Minnesota, August 10, 10 a.m.-6 p.m., McLeod County Fairgrounds (Hutchinson).